You might think that a show with 5,500 students singing, dancing, playing and acting staged in one of Australia’s biggest venues is just about impossible. Think again. We’re talking about the Guinness World Record-holder for the world’s largest variety show, the NSW Schools Spectacular. In an exciting win for Jaden Digital, the boutique digital marketing agency specialising in music and entertainment, has this month been awarded the tender to handle integrated marketing for the family entertainment event of the year. 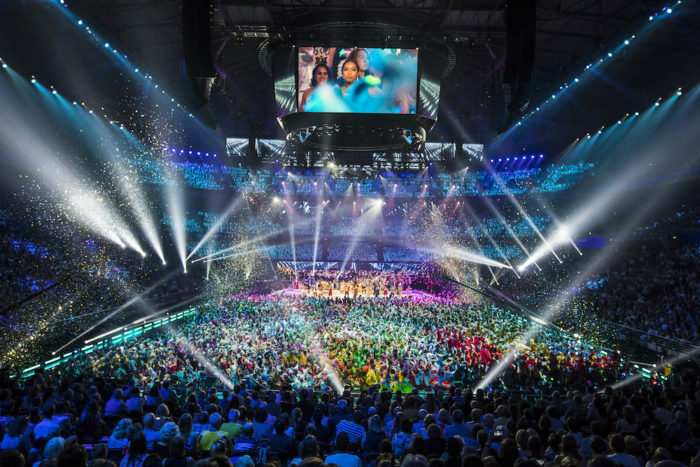 The agreement will see Jaden Digital manage marketing, media, digital and social across the 2018 to 2020 productions of Schools Spectacular, held at Qudos Bank Arena in November. Jaden Digital underwent a competitive pitch in collaboration with the recently launched JadenLIVE, to secure the account. Schools Spectacular is an initiative of the NSW Department of Education. Now in its 35th year, Schools Spectacular features 2,300 dancers, a choir of 2,700, an 80-piece symphony orchestra and almost 200 featured soloists across a number of disciplines. The show is seen by 30,000 people across 4 performances, with millions more tuning into the national television broadcast on Channel 7 in December. The theme for this year’s Schools Spectacular is The Greatest, and general public tickets are on sale now through Ticketek. This is truly an event that no-one should miss.